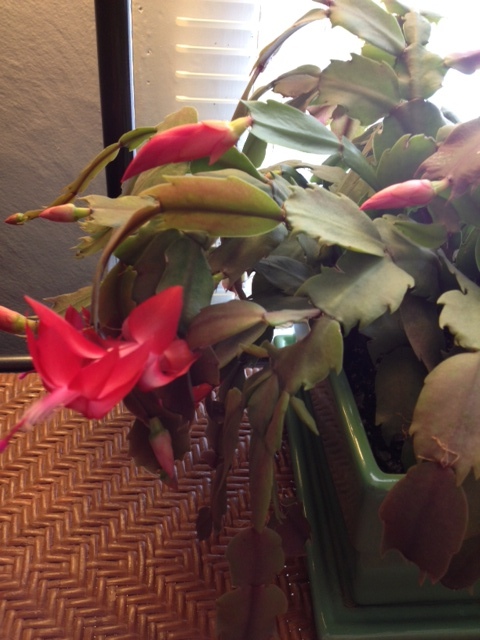 I thought its time had come and gone, its 15 minutes of blossoming fame, but I woke this morning to two open flowers on my Christmas cactus, with the budding promise of eight or nine more. This 7-year-old cactus has been flowering since late November, more than making up for last season’s one-and-done blooming performance. It’s the perfect mascot for my new year’s Intentions, ones filled with a desire to achieve my goals despite the inevitable changes, setbacks and general bumps in the road. I like the word “Intention” rather than “resolution” because there’s something more mindful, more encompassing about Intention. So, forget all that “road to hell” BS about Intention because the way I’m writing about it here, it isn’t just a nice thought of what we’d like to do but forget two seconds after we think it. Intentions are a breeding ground for mindfulness. They are my inquiry into why I behave and think the way I do. Intention, to me, is a proper noun and therefore needs to be capitalized Intention is a friend, a teacher, a counselor with a name. Ms. Intention. And she has a big job ahead of her this year. Intention isn’t a road map. It’s a starting place. It’s a consciously made list of the behaviors and thoughts I most want to engage in in order to live the life I want. Intention isn’t a wish. “I want to be skinny” is different than “I Intend to lose 20 pounds because I want to better control my blood pressure and arthritis.” Intention implies action. Of course “imply” isn’t “does.” Intention isn’t going to go to the gym for me or meditate for me or fix a healthy meal for me or study for me or save money for me. Intention is my go-to place when I need to be reminded why I’m going to the gym instead of playing Angry Birds all morning; making a healthy meal, even when I’d rather nose dive into fettuccine Alfredo; doing my homework instead of wandering aimlessly on the web; not buying something I don’t need in order to save money for the things I do need. Whenever someone asks me how to lose weight, I tell them to not start with a “diet,” but rather to start with writing down the reasons she wants to lose weight. That reflection leads to Intention, and it’s her Intention that she can look back on when faced with the challenges of weight loss. Intention can’t work alone, though. It needs Confidence (or Faith) to succeed. Unlike Intention, Confidence isn’t a statement of goals. It’s not a reminder. Confidence isn’t an action, but rather a muscle that takes time and repetition to build. For instance, when I’m aware that I’m wandering around the kitchen, I have the capacity to ask myself, “What’s going on here that is making me mindlessly stare into the refrigerator?” Remembering to be aware builds my Confidence that the next time, I have a good chance of staying present. It’s not rocket science, yet at times it feels like it. I mean, if our Intention is to lose 10, 50, 100 pounds, it our actions toward that goal that build our Confidence, right? But tracking food intake isn’t easy at first (and sometimes never). Neither is figuring out what food is best to eat in terms of our desired carb/fat/protein ratio, which in and of itself can be confusing! But the more we learn and the more we track, the better we get at it, and in the process, we’re living our Intention. I liked the example Buddhist teacher Gil Fronsdal gave in a recent dharma talk, “The Faculty of Faith.” If your Intention is to learn to ride a bike, then the more you ride, the more Confidence you gain. And if you fall off and your Confidence is shaken, remembering that it’s still your Intention to learn to ride a bike is what will get you back in that seat. Say you develop a food and exercise plan because your Intention is to lose weight and get fit. You go for a few weeks spot on every day with your food intake and exercise goals. Then you go out to a restaurant or to a party and your favorite foods are there and you take one then three then twenty bites even though in the back of your mind something’s screaming “Stop!” But you don’t listen and then you wake up the next morning feeling guilty. Your Confidence is shaken. Do you say, “I can’t lose weight! I’ll go eat donuts!” or do you get into your workout clothes and hit the gym? Distraction from our Intentions isn’t a crime worthy of guilt. It’s not a crime at all. It’s the perfect place for reflection and mindfulness. In the ancient Buddhist texts, the root word for Confidence meant “hospitality.” As Gil said, it means “being a good host to your experience, a good host to whatever’s going on.” Intention and Confidence does not want us to treat ourselves unkindly when we forget or when we fall down. They merely want us to stay present, to pay attention to what’s going on with ourselves and to be kind. I’m choosing this year to live my Intentions, moment by moment, to the best of my ability. To build Confidence at the gym, in the kitchen, at school, within my relationships, when I’m lonely, when I’m happy, when I’m afraid. And when I feel myself striving too hard or separating from the present, I will call on my Intentions to set me back on the path. If it’s your Intention to get fit and you’re looking for some wise (and fun) counsel, I strongly encourage you to read Carla “MizFit” Birnberg’s book “How to Build Muscle and Lose WeightWithout Losing Your Mind.” I’ve been reading Carla’s blog for years and her down-to-earth approach to life, fitness, motherhood, you name it has grounded me many times, especially those times I didn’t realize I was ungrounded! Her book is helping me rev up my fitness routine and no, she didn’t pay me to say that! I just love Carla’s honesty. It works for me. To win a copy of Carla’s book, all you have to do is leave a comment and your name will be thrown into the hat for the drawing on Monday, January 14. You don’t have to write anything profound. Just “Hi” will do. Or you could list one of your Intentions. That would be great! Good luck! This entry was posted in Mindfulness, Weight Maintenance on January 9, 2013 by Lynn Haraldson. I love the idea of “Intentions” in lieu of resolutions. Intentions usually go further and last longer! Lyn, SO TRUE! You can't start a journey to lose weight with the mentality that “you're going on a diet.” A diet has an end. This is never-ending–it's for the rest of my life and that is my one and only intention!!! I always listen to MizFit and DietGirl's podcasts. They are GREAT! I had an Intention in January 2012 to go 5 days without sugar, just to see if living without an inflammatory would really ease my arthritis pain. It took away 90% of it, so I continued. The happy side effect was losing 30 pounds over the year and I'm now going to the gym 5-6 days a week. Intentions are good, Lynn – great post, BTW! Glad to see you are writing again 🙂 I'm all over the Intention as a proper noun – well said. So intentions for now on. I like it. Intention….it's my intention to keep plugging along toward becoming the best fit and healthy version of myself that I can possibly be. I'm worth it. I would love to win too! My weight loss journey is such a mind game, but I intend to conquer it! I intend to heal. Not physically but also mentally. Saw something the other day and gist was why are you looking backwards, you are not going in that direction. It really hit home. I can not let my past define my future (when it comes to my knee). I think it's important to learn from past mistakes but keep on trying… And not dweeling. My intention is to get healthy this year. Intention is a great word. I did not make one resolution this year and it feels good! I have a mile stone birthday this coming December and I intend to feel and be the best I can- mainly to be comfortable with who I am and taking the initiative to make me a priority along with the family. I read a Jane Fonda article in the Washington Post this week that struck me as interesting. She felt her best in her 60's and is one fit lady at 75. She looks back and ahead and finds herself more glamorous now than when she was younger. Her outlook and perspective was uplifting. All the best in 2013- so happy to read you will be blogging again Lynn!!! I may be late for the contest, but if not, I would love to be entered. Thank you so much! I've missed reading your blogs, but I know what it's like trying to juggle school, work, and family not to mention Intentions. (I like that capitalized.) You have been and continue to be an inspiration. Please include me in your drawing. Sarah, the past is soooo alluring, isn't it? It's the place we spend far too much time, and for me, I spend that time beating myself up rather than truly LEARNING from it and moving on. Thanks for sharing that quote. Lynn P., I heart Jane Fonda. I used to do her workouts all the time in the 80s (sans the leotard!). I'm glad she's still a voice in the fitness world. Love the intentions post. Mine is learning to love myself and others more. Just be kinder yo all. Meaningful post. I identify with the career point too as I try to find a path determined by me. I truly enjoy reading maintainers thoughts and believe we all want to lead healthy lives. It's a journey.